The Donald’s sole Canadian property is worth $500 million, and exudes opulence extravagance from the penthouse straight down to the lobby, where guests are surrounded by black marble cladding and can admire the Swarovski crystal sculpture behind the front desk. At 65 storeys, the building holds the title for tallest Canadian residential building. There are 261 guest rooms and suites at this luxurious Toronto hotel, plus 118 condo units for residents. The luxury isn’t just for guests, though. Anyone with the funds can broker a deal at the aptly named Stock Restaurant Bar and Lounge, have a nightcap at Suits Lobby Lounge (where a stock market ticker can be found behind the bar) or get pampered at Quartz Crystal Spa, which is located on the 31st and 32nd floors and offers expansive views of the Toronto skyline. Guests are also invited to swim laps in the heated 65-foot-long infinity pool designed with Calacatta marble and to rest their heads on Italian Bellino linen. Looking for a place to host a luxurious event in Toronto hotel? There’s a 12,000 square-foot grand ballroom with ornate black chandeliers that will be sure to impress your invitees. There’s so much to see and do in this city, but after a while, admission fees, restaurant bills and shopping sprees start to add up. Where Toronto helps you get the most out of your trip without burning a hole in your pocket. Check back each week for our thrifty tips on discounted tickets, exclusive sales, free events and more. Get glammed up for a low price at Marvel Beauty Schools. The cost for a cut, colour and style in Yorkville can run you well into the triple-digits. But not at the posh neighbourhood’s Marvel Beauty Schools, where you can treat yourself to professional grade salon and spa services starting at less than $10. In the salon, help students hone their skills by giving you a full haircut, updo, weave, colour highlights, perm—almost anything. In the spa, esthticians-in-the-making provide what’s likely to be the most inexpensive pedicure, body wrap, wax, massage or facial you’ve ever had. Don’t worry about fried hair or a botched bikini wax—students only work on clients once instructors decide they’ve had sufficient training, and supervisors watch with a vigilant eye while they work. Salon open Mon. to Fri., 8:30 a.m. to 2:30 p.m. (Wed. to 7 p.m.). Spa hours are Mon. to Thu., 1 to 3 p.m. (Wed. to 7 p.m.), and Fri., 9 a.m. to 3 p.m. Learn about Osgoode Hall with a free audio tour (photo by Five-two). Beyond high cast-iron gates and beautifully manicured grounds sits Osgoode Hall, a landmark dating back to 1832. Devoted to all things legal, the Palladian-style building is home to the Law Society of Upper Canada, the Court of Appeal for Ontario and the Superior Court of Justice. Inside, its Convocation Hall has been converted into a high-style lunchtime resto, but you don’t need to cough up the cash to enjoy it. 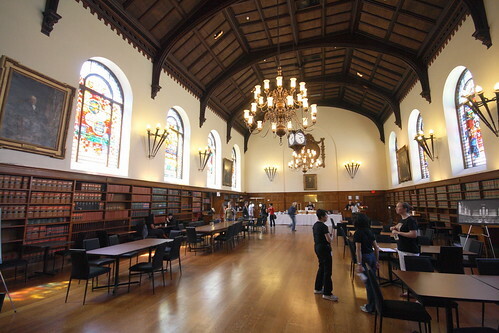 Download the free audio tour of Osgoode Hall’s Convocation Hall to your iPod and explore the magnificent space without paying a cent. Allow the voice of Law Society curator Elise Brunet guide you through the Hall’s history and architectural changes, and provide background on points of interest in the room, from the ten stained glass windows to the carvings on the balcony railing. Download the audio tour for free from the Law Society of Upper Canada’s website.